Hikvision IP Network cameras may have Alarm Input and Output options. To know if the camera does have this option, refer to its specifications. For Value and Value Plus series cameras (DS-2CD2...), you can look at the SKU of the camera. The "S" at the end after the "-" indicates the camera has Alarm IO and Audio abilities. For example, DS-2CD2142FWD-IS has alarm IO but DS-2CD2142FWD-I does not. Most PTZ cameras and Smart Series cameras do have alarm IO but refer to the specifications to be sure. The actual connectors for Alarm IO can come in a few different forms. Value Plus and Value series cameras have the IO on the pigtail with screw down terminals or bare wires. PTZ cameras usually have bare wire coming out of the pigtail that will be labeled. Connecting or using the IO can be different for each camera. For this reason this is only a reference. All information should be confirmed by the manufacturer of the particular model of camera you are using. In a lot of cases, the lower cost cameras will have an open collector style output. Open Collector output requires external power to work if the pigtail has no power output. The Inputs typically will just need to be either open or shorted to ground for the two states. The "PIR" in the example below can be a switch, door sensor, PIR, or anything that can act like a switch. Within the camera's GUI you can select if this input is Normally Closed (NC) or Normally Open (NO). Note in thess examples, there is an external 12v power supply that is used to power the relay. The output can only sink a limited amount of current. This limit is provided by the manufacturer (it's not always included in the specifications). The relay should be low powered relay, not an automotive relay. With this type of output, simply using a multimeter to test if the output is working or not won't necessarily work. You will need the external power source. DO NOT Connect 12v directly to the "output" terminal as this may burn out the output driver. There must be some kind of resistance between the 12V source and output to control the current flow through the output. 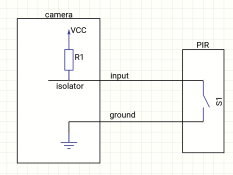 Here is an another example of how to connect a relay on a board to the output of the camera.